It seems a number of UK users are running into a brick wall when attempting to install the free preview version of Windows 8.1 that was released yesterday. The problem lies in British English falling outside of the 13 languages supported by the release, which causes the message "The update is not applicable to your computer" to appear during installation. According to a post by a Microsoft representative on the company's forum, UK customers will be able to install the preview using an ISO preview image once it becomes available in the near future. However, if you're unprepared to wait, there are two workarounds. The first is to change the operating system's language from British English to US English in the control panel before giving the machine a restart and trying the install again. Of course, taking this route means you'll have to put up with our friends across the pond's way of spelling for the foreseeable future. If you're unprepared to wait (and feeling a little courageous), a second, potential workaround has been offered by a Microsoft community member, which should allow you to install the preview without changing the operating system's language. We haven't had chance to test this ourselves, so apply it at your own risk. The situation is a little different for Windows RT users, who won't be able to install from an ISO. However, Microsoft has advised users against changing the base language on their devices just to install the Windows RT 8.1 Preview as there's no way to restore it afterwards. It's also asked users not to install the preview if they've installed a language pack on Windows RT, adding that a fix will be available soon courtesy of a Windows Store update. Again, if you're the sort that prefers to take caution and sling it headlong into the wind, the same Microsoft community member has suggested that Windows RT users replace the "x64.cab" on the end of step four found above with "-arm.cab". 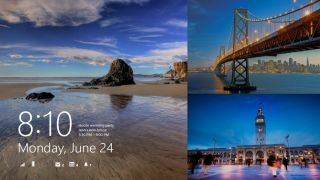 Microsoft officially revealed the preview of Windows 8.1 during the Build developers' conference opening keynote on Wednesday. Among the latest version's improvements are a return of the start button and a 'boot to desktop' option.